Early hotels called their guests to meals with loud bells, and saloons served free lunches, heavy on the seasonings, to keep their customers thirsty. Managers of the Eagle Hotel, Bronson House and Bridge Street House called their guests to meals with loud sounding bells. Boarders formed long lines at the entrance to the dining rooms and when the bells were sounded, rushed in to grab the preferred seats. Meals cost 25 cents per person. The Eagle and Bridge Street House catered to the farmer and the Bronson House to river men, factory hands and laborers. Hotel clerks, chambermaids, scrubwomen and porters assisted in serving meals. Because of their strong smell, Hostlers were restricted to eating in the barns with the horses. Saloonkeepers served free lunches to customers. Cold ham, salted fish, potato salad, rye bread and sour beef, all highly seasoned, were place upon the bar, and patrons were free to help themselves. 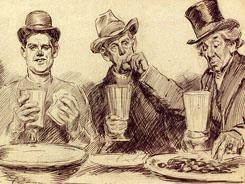 Mustard, horseradish and other condiments created thirsts that the barkeep was eager to appease. The keeper of a basement saloon exchanged commodities with the cooks of Sweet’s Hotel. The cooks furnished the edibles for the saloon, and the saloon drinks for the cooks. In 1879, Saunders and Whitney opened a disorderly house adjoining the Soldiers Home. Occupants of the home were among its faithful patrons. The legislature passed a bill prohibiting the sale of liquor within a mile of the Home causing Saunders and Whitney to close. However, by crossing the river, the occupants of the Soldiers Home obtained as much liquor and debauchery as they desired at the Mill Creek Tavern.